I recently had the pleasure of taking over my friend Jo's beautiful kitchen for an evening and cook for some fabulous foodie friends of mine. Living in a small apartment with a closet-sized kitchen means I never get to entertain at my place, but I've been itching to host a dinner for some time now. So when Jo so kindly extended an invitation to me to use her kitchen—her big, beautiful, bright, 2-ovens, 6-gas ranges, LOTS of counter space kitchen—I took her up on the offer. How could I turn down this opportunity? It was like offering candy to a kid! My favourite part about doing a large-scale, multi-course dinner like this one is the planning stage. It's the time when I can be the most creative and have a lot of fun with the research as I starting pulling together the menu. How do I begin? Often with the season, as it dictates what kind of fresh produce I'll be able to find at the market. And then I'll consider dishes that I really want to make—s'mores cake, homemade ricotta, homemade pasta, etc. I flip through cookbooks. I go through old photographs of memorable meals I've had at restaurants. I dust off old notes I jotted down in haste—on napkins, on scrap paper, on my phone—when sudden inspiration had taken over and I didn't want to forget the idea for future use. The whole process took almost two months, constantly writing and rewriting the menu, an ebb and flow of courses and ingredients, until the tide settled and I had my final menu in place. 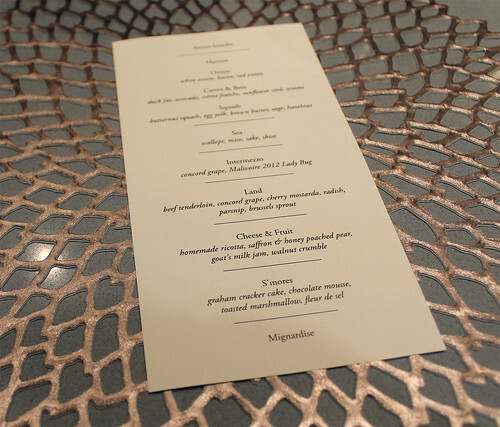 The resulting menu, which probably wasn't fully finalized until a week before the dinner, contained ten courses in total—an amuse, two starters, one pasta, one seafood, a palate cleanser, one meat, two desserts, and a mignardise. An ambitious menu, yes, but I'm not one to shy away from a challenge in the kitchen, and I did factor in the execution and timing of each dish to assure myself that this was doable. 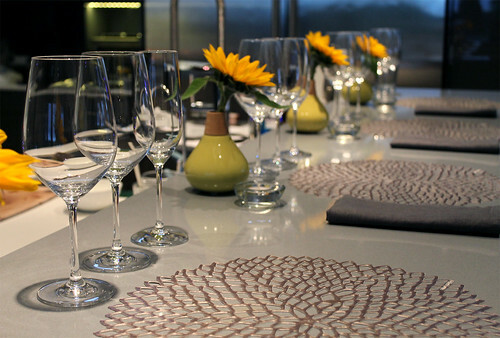 Careful consideration was also put into the progression of each dish, and that the general theme strung through each and every course. Nothing is more confusing to a diner than a tasting menu that just doesn't make a whole lot of sense from start to finish, with a mish-mash of courses. 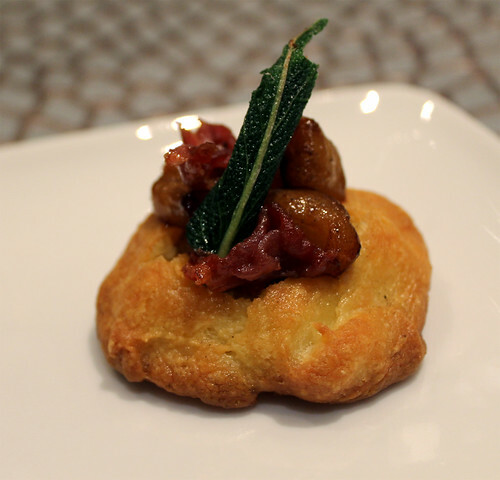 The evening started off with a little amuse bouche of white cheddar gourgère topped with a spiced apple pulp and fried prosciutto and sage. This was my answer to bread service, which I really wanted to incorporated into dinner, but knew would take a lot of my time and attention. Gougère dough, on the other hand, does not require kneading and rising time, and comes together fairly quickly. The recipe comes from Tyler Florence's Fresh. The next three courses revolved around harvest vegetables—fall is a very bountiful time and I wanted to make the most of the fresh local produce I'd be able to find at the farmer's market. 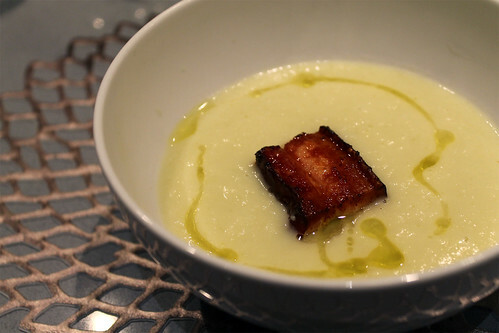 The first of the harvest courses was a creamy white onion soup. The technique is similar to a French onion soup, in that the onions are cooked low and slow until meltingly soft. The difference is that you don't take on any colour by caramelizing the onions to ensure a whiter appearance and a milder flavour. A spoonful of red onion jam sat at the bottom of the bowl, then topped with a big hunk of crispy bacon before soup was poured all around it. The recipe comes from the September 2013 issue of Bon Appétit, and is available here online. 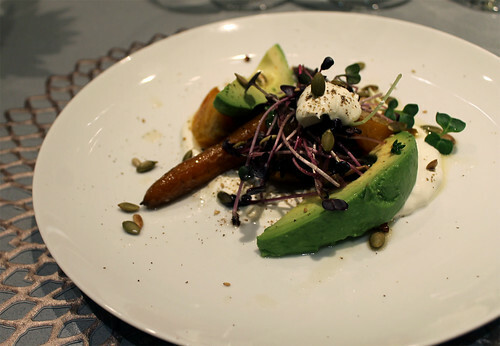 The second of the harvest courses centred around beautiful, in-season beets and carrots. I picked up some lovely baby heirloom carrots from the farmer's market and decided to roast them in duck fat (because everything tastes more delicious in duck fat!). Roasted golden beets and just ripe avocadoes were added to the plate to add some colour and to balance out the flavours and texture. Crème fraîche for some tartness and creaminess. Toasted seeds for some crunch. Red daikon radish sprouts for some colour and spiciness. All tied together with a sweet and tart citrus vinaigrette. Fresh pasta can be quite time consuming, but it is so well worth it in the end. It requires your full attention, as you can't really step away from it while you've got the pasta machine running. and constantly flouring the dough and your work surface to ensure nothing sticks together. I also have learned over the years that you really can't rush the process if you want pasta with the perfect texture—much like bread, kneading the dough helps build up the gluten, which will greatly affect the texture of your cooked pasta. The highlight of this harvest dish was the butternut squash, topped with an egg yolk. The ravioli is cooked for three minutes, ensuring that the pasta is cooked to a perfect al dente while the egg yolk still remains runny. 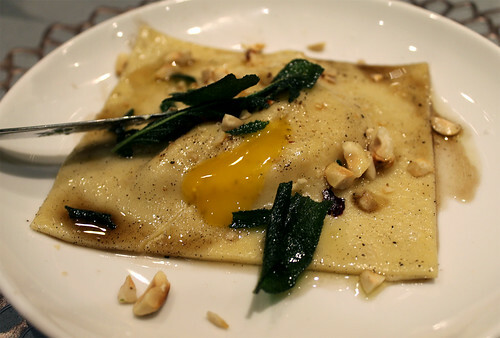 The oozing egg yolk, once you puncture the pasta dough, essentially self-sauces the ravioli, but I also served it up with a very classic brown butter, fried sage and toasted hazelnuts. My heart was set on scallops for the seafood course. However, with my main ingredient chosen, I couldn't figure out what I wanted to actually do with them. After a few weeks of pondering, I decided to take an Asian spin on this dish. The miso beurre blanc is my take on a traditional French beurre blanc sauce—traditionally made with white wine and white wine vinegar. Instead, I've swapped out the French ingredients for Japanese ingredients—sake for white wine; rice vinegar for white wine vinegar. 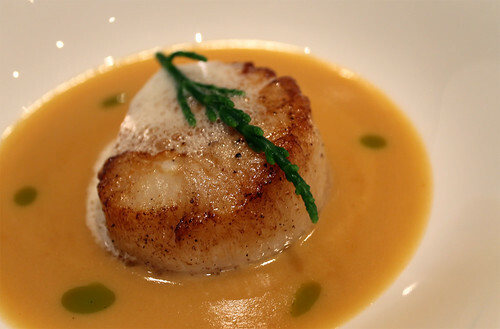 The umami-packed miso gives the usual delicate French sauce a whole new dimension. The dish was finished off with some sake foam, homemade shiso oil, and blanched sea asparagus that I managed to find at the farmer's market earlier in the day. I included a little palate cleanser in between the seafood and meat course as a little breather in the meal. 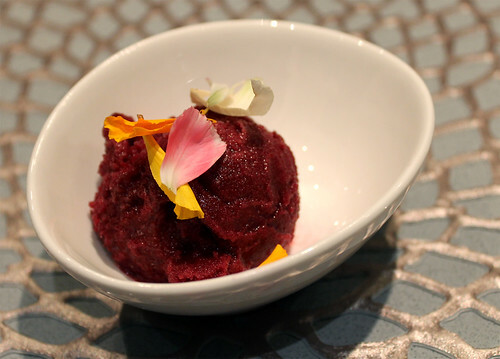 I found some beautiful concord grapes at the market the week before, and made a sorbet using the grapes with a little Malivoire 2012 Lady Bug thrown in. It took me some time to decide what my main protein would be for the meal. After much consideration (and some considerable flirtation with the idea of lamb or duck—two of my favourite meats), I decided to play it a little on the safer side and go with beef. I knew everyone at the table likes beef, and it's a nice, hearty meat that would be perfect to serve in an autumn meal. I decided to douse the beef in a dry rub that's packed with warm flavours—a spice ash made with charred cinnamon, star anise, juniper berries, szechuan peppercorns, and cloves. The spice ash smells absolutely incredible as you grind it up, and the rich dark colour turns the beef tenderloin into a charcoal-like crust as it sears in the pan. 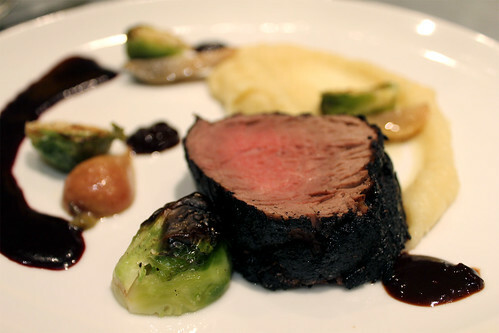 The beef was served up with a grape concord reduction, some cherry mostarda that I had preserved back in July with the cherries I picked in Niagara, radish confit, parsnip purée, and roasted brussels sprouts. I wanted to do a play on the cheese course without actually serving up a hunk of cheese in the traditional way. Making my own fresh cheese has been on my list of "things to do" for quite a while now, and I thought this was the perfect opportunity to finally knock it off my list. It's surprisingly very easy to make (and requires very little maintenance or supervision), and the result is an incredibly creamy, sweet fresh ricotta with an underlying citrusy tang to it. Perfect to serve alongside some saffron and honey-poached forelle pears to create that fruit and cheese combination. The dish was finished off with some homemade goat's milk jam (also known as cajeta—especially delicious stirred into coffee! ), walnut brittle crumble, sea salt, and some thyme. 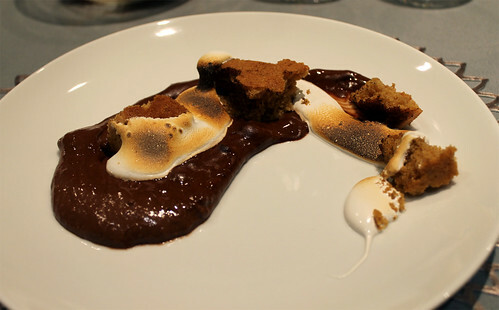 The s'mores cake idea had been stewing in my head for a couple of months actually. I had made marshmallow cream earlier in the summer (see Cake Day), and then brought ingredients to make s'mores another time. And then it occurred to me, why not make a s'mores cake? And so I did! It seems like tear cake is the fashion du jour at many restaurants, and that is the method I went with. I tore up pieces of the graham cracker cake, placed them atop some chocolate mousse, piped on some marshmallow cream, and took a torch to it. I had also prepared some chocolate cinnamon macarons as a mignardise, but the girls were so stuffed by the end of the meal that we saved them for brunch the next day. It definitely requires A LOT of advance planning and organizing—extensive notes and sketches, and a schedule helped to keep me on track so that I wouldn't be floundering around in the kitchen like a headless chicken. I did a lot of my prep work ahead of time to save me time the day-of and keep me stress-free. Anything that could be made ahead of time was, so that all I had to do was reheat before plating the dishes. Anything that couldn't was added to a detailed schedule to ensure that I was kept on track the day-of and didn't inadvertently miss a component. The question I have been asked a lot post-dinner is, what possessed me to take on such an endeavour? Was it utter madness on my part? That inner competitive edge in me trying to outdo myself in the kitchen yet again? 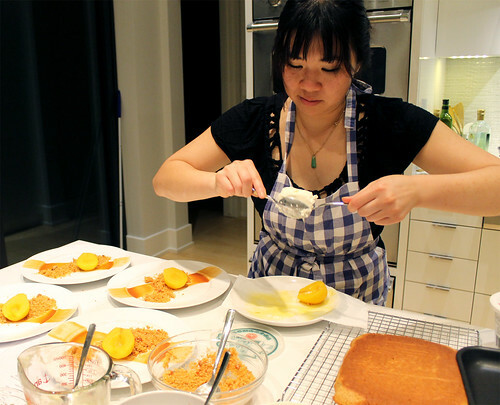 Frankly, it's just my sheer love of cooking and desire to share it with others. 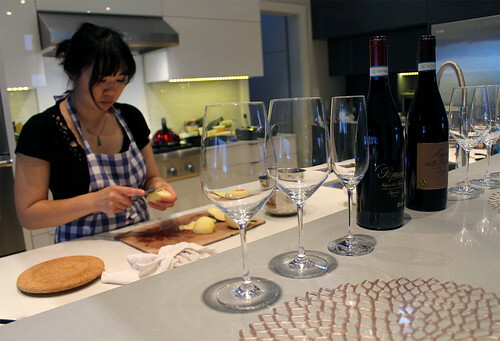 It gets rather dull cooking for one, and my everyday meals are often quite simple. I'm a strong believer that food is meant to be shared, and that it can only truly be appreciated in its fullest when it's shared. Because what's a meal but a social means—a gathering of family and friends around a table, sharing conversations, ideas, debates, laughs, tears—all over the simple notion of food. In a fast paced world, when we barely take the time to slow down and enjoy the smaller things in life (goodness knows how many countless times I've scarfed down lunch or dinner in sheer minutes! ), dinners like these forces us to slow things down and appreciate the smaller things in life, like the simple act of eating. A big, big thank you to Jo for allowing me to make a mess of her kitchen! 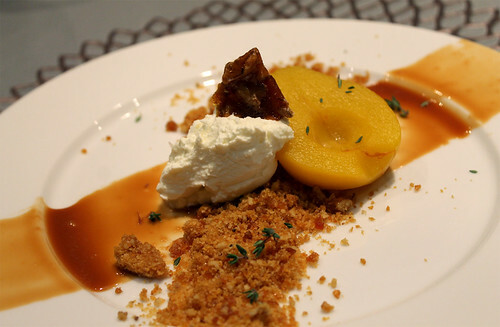 To see more photos from my Bon Feeds tasting menu, check out my Flickr set.